Home / MOVIE REVIEWS / Movie Review: "Chef" a very refreshing film about life, love, food and starting all-over again. 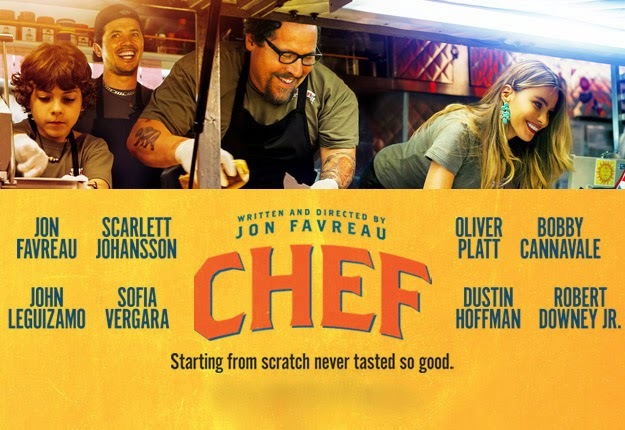 Movie Review: "Chef" a very refreshing film about life, love, food and starting all-over again. "Chef" is a film about taking chances and mending the scars of unlikely incidents. The film focused on Carl Casper (Jon Favreau), his journey to rediscover his passion and reconnecting with his family. I admire how the film consistently focused on the developments of the characters. "Chef" allows you to understand and relate to the characters as the plot unfolds details on the interesting mix of its cast. One of the good message that the movie promised and delivered as seen on the poster below is, "Starting from scratch never tasted so good." Carl Casper is an acclaimed chef with a family life that seems as decaying as his artistic freedom. Those frustrations boil over into a raucous viral-videoed public confrontation against a restaurant critic who panned his cooking of food that his boss (Dustin Hoffman) ordered him to make against his instincts. Now with his career ruined, Carl's ex-wife (Sofía Vergara) offers an unorthodox solution in Miami: refit an old food truck to offer quality cooking on his own terms. Now with his young son, Percy (Emjay Anthony), and old colleague, Martin (John Leguizamo), helping, Carl takes a working trip across America with that truck to rediscover his gastronomic passion. With Percy's tech savvy and Martin's enthusiasm, Carl finds that he is creating a traveling sensation on the way home. In doing so, Carl discovers he is serving up more than simply food, but also a deeper connection with his life and his family that is truly delicious in its own way. My favorite parts of the film was the several bonding scenes between Carl and Percy as father and son. It was not perfect but the gradual improvement of their relationship enveloped in a broken family status was impressively executed. "Chef" also showed what it truly means to be someone's friend in the character of Martin and his undying support for Carl who lost almost everything. Carl's still supportive ex-wife Inez (Sofía Vergara) that gave him another chance on being a father to Percy. I also enjoyed Molly (Scarlett Johansson) and how her character here is greatly differentiated to her recent superhero/human characters. The cameo of both Dustin Hoffman and Robert Downey Jr are memorable and impressive. I also love the vibrant cooking scenes of Carl in the movie. From preparing the perfect grilled cheese sandwich to the exotic menu with an array of flavors, the cinematography invites you to try and savour the dishes he prepared. If you are looking for a film with a different flavor and twists try watching "Chef", now showing on your favorite cinemas.